SYRACUSE, NY (WRVO) – As advocacy groups continue to pressure Albany on various causes ahead of this year’s state budget, a statewide educational equity tour made a stop in Syracuse, last week. A collection of local officials and other advocates said New York’s schools are underfunded by $4 billion. The New York State Assembly, Senate and governor, have to come to an agreement on the budget. Gov. Andrew Cuomo proposed a billion dollar increase in school aid this year. Some legislators are trying to get that number closer to $1.6 billion for the next three years. Central New York state Sen. Rachel May (D-Syracuse) said particularly in the Senate, they need to insist this is a top priority and not back down. May was joined by state Sen. Robert Jackson (D-Manhattan), both of whom are serving their first terms as senators. Jackson was part of the Campaign for Fiscal Equity lawsuit in 1993. That led to a court ruling in 2006 that said the state was not fulfilling its constitutional duty. 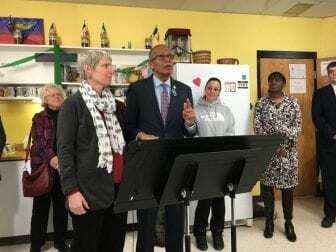 Advocates with the Alliance for Quality Education said Syracuse schools are owed $45 million, which they said is especially needed, because the city has the highest concentration of poverty in the state among minority children.